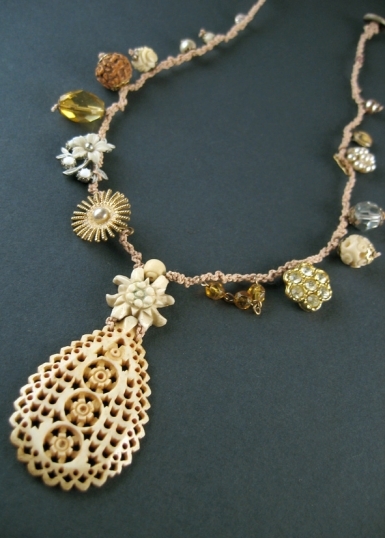 A pretty vintage compriiiiising pierced bone centrepiece, with sparkly trinkets, carved bone flower (edelweiss...a symbol of loyalty,and collected from Alpine pastures by young male lovers as demonstartions of love for thir betrothed) and vintage cut glass beads, all woven onto natural linen thread. Length 38 -40cms, extending to 50cms with added button and loop extension (or if you require a different length you can order a specific length of extension at no extra charge). Comes beautifully presented in a gold embossed fur-lined (faux of course!) box. FREE POSTAGE ON THIS ITEM !